Introduction : Around 3.2%–8.4% of patients receive venoarterial (VA) extracorporeal membrane oxygenation (ECMO) support after pediatric cardiac surgery. The desired outcome is “bridgetorecovery” in most cases. There is no universally agreed protocol, and given the associated costs and complications rates, the decisions as of when and when not to institute VA ECMO are largely empirical. Methods : A retrospective review of the ECMO database at the Scottish Pediatric Cardiac Services (SPCS) was undertaken. Inclusion criterion encompassed all children (<16 years of age) who were supported with VA ECMO following cardiac surgery between January 2011 and October 2016. The timing of ECMO support was divided into three distinct phases: “endofcase” or intheatre ECMO for patients unable to effectively wean from cardiopulmonary bypass (CPB), ECMO for cardiopulmonary resuscitation (“ECPR”), and Intensive Care Unit ECMO for “failing maximal medial therapy” following cardiac surgery. 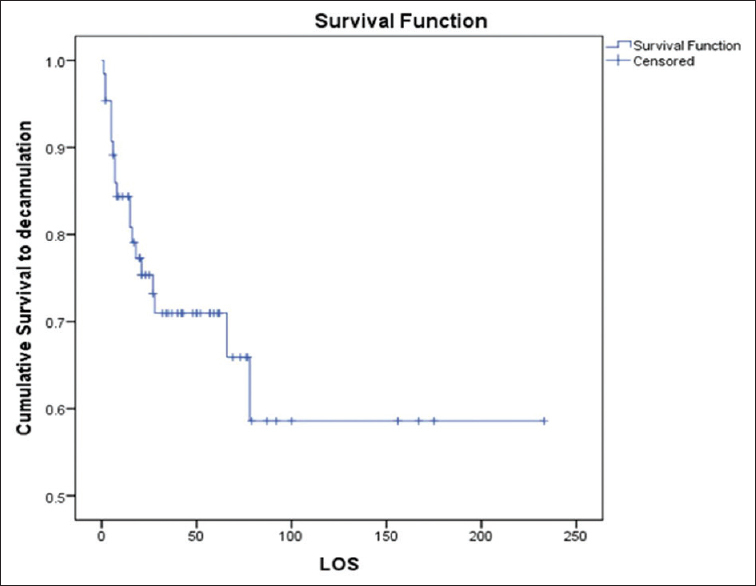 The patients were analyzed to identify survival rates, adverse prognostic indicators, and complication rates. Results : We identified 66 patients who met the inclusion criterion. 30day survival rate was 45% and survival rate to hospital discharge was 44% (the difference represents one patient). On followup (median: 960 days, range: 42–2010 days), all survivors to hospital discharge were alive at review date. “Endofcase” ECMO showed a trend toward better survival of the three subcategories (“end of case,” ECPR, and ECMO for “failing maximal medical therapy” survival rates were 47%, 41%, and 37.5%, respectively, P = 0.807). The poorest survival rates were in the younger children (<6 months, P = 0.502), patients who had prolonged CPB (P = 0.314) and aortic crossclamp times (P = 0.146), and longer duration of ECMO (>10 days, P = 0.177). Conclusions : Allcomers VA ECMO following pediatric cardiac surgery had survival to discharge rate of 44%. Elective “endofcase” ECMO carries better survival rates and therefore ECMO instituted early maybe advantageous. Prolonged ECMO support has a direct correlation with mortality. Since its inception in 1973, extracorporeal membrane oxygenation (ECMO) has been a valuable tool in salvaging patients who develop cardiorespiratory failure after cardiac surgery., ECMO has been utilized following both adult , and pediatric cardiac surgeries , with encouraging results. As much as 3.2%–8.4% of children undergoing congenital cardiac surgery may require ECMO support in the postoperative period for cardiorespiratory failure.,, The main utility of veno-arterial (VA) ECMO is to provide cardiac output while “resting” the heart following the operative insult, to allow time for recovery of function and “bridge to recovery.”, In smaller proportion of patients in whom adequate functional recovery is not achieved, ECMO can be used to support the circulation until alternatives are instituted including ventricular assist device (VAD), orthotopic heart transplant (OHT), or end-of-life care.,, Among other indications, VA ECMO can also be utilized to temporize and stabilize preoperative patients in cardiorespiratory failure to “bridge to cardiac surgery.” Due to the heterogeneity of conditions and patient factors, the indications and timing of VA ECMO in postcardiotomy patients are based on empirical clinical judgment. Reversibility of the underlying etiology of circulation failure is, however, a key to a successful outcome. Despite its many advantages, VA ECMO is associated with major complications ,,, and it carries a significant cost burden;, therefore, the risk–benefit ratio should be weighed before institution of this salvage strategy. In this study of the SPCS unit, we aimed to identify determinants of survival in postcardiotomy VA ECMO in the clinical scenarios delineated above. A retrospective review of the ECMO database at the SPCS was undertaken. Our inclusion criteria encompassed all neonatal and pediatric patients (<16 years of age) who underwent VA ECMO following cardiac surgery between January 2011 and October 2016 in Scotland. Patients were identified from the ECMO database; further clinical details were obtained from the clinical database, “HeartSuite™” database, and reviewed by two assessors (MK and MD). We then risk stratified the patients using the Risk Adjustment for Congenital Heart Surgery (RACHS) score based on the type of morphology and operation. We divided the patients into three subgroups based on ECMO timing: “end-of-case” where patients had ECMO support initiated in the operating theater, following cardiac surgery; “E-CPR” where patients who sustained cardiorespiratory arrest were receiving ongoing external and/or internal cardiac massage when ECMO was initiated; and patients in whom ECMO was instituted during their PICU or ward stay because of “failing maximal medical therapy.” As with many other programs, we currently do not have a protocol defining a set inotropic support threshold to define “failing maximal medical therapy.” The decision as of whether or not the patient has reached the ceiling on medical therapy is made on a case-by-case basis judged by the multidisciplinary team. We obtained follow-up (FU) data on patient's survival and quality of life following institution of postoperative VA ECMO. We performed univariate analysis using the Fisher's exact test to address the small patient population in our cohort [Table 1]. 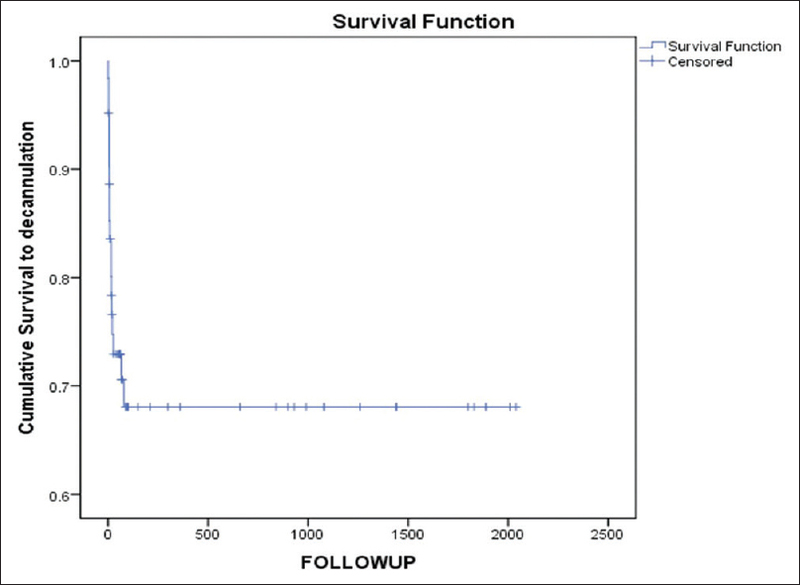 We utilized the Kaplan–Meier curve to ascertain survival. We used the log-rank test to determine statistical significance of the effect of ECMO duration and outcome to address the skew in our data and the effect of heterogeneity in our patient population. The primary outcome measure was to determine the rate of survival to hospital discharge in postcardiotomy VA ECMO following pediatric cardiac surgery. The secondary outcome measure was to identify most likely factors leading to a favorable outcome, i.e., survival to hospital discharge and intermediate-term survival. We identified 66 (4% of the total 1594 pediatric cardiac surgical cases) patients in the study period who met the inclusion criteria. In our patient cohort, 72% (n = 49) had had elective surgery and the remainder underwent urgent/emergency surgery (n = 17, 28%). The type of operations leading to VA ECMO was diverse. We have risk stratified the patients based on the morphology and the type of operations using the RACHS score [Table 1]. However, the most common pathologies leading to postoperative VA ECMO were transposition of great arteries (TGAs), hypoplastic left heart syndrome, and tetralogy of Fallot (TOF). We assessed the correlation between the duration of CPB and cross-clamp (XC) times for each operation with the likelihood of needing postcardiotomy VA ECMO and survival. Not surprisingly, we noted an increasing utility of VA ECMO support and mortality associated with longer CPB and XC times. 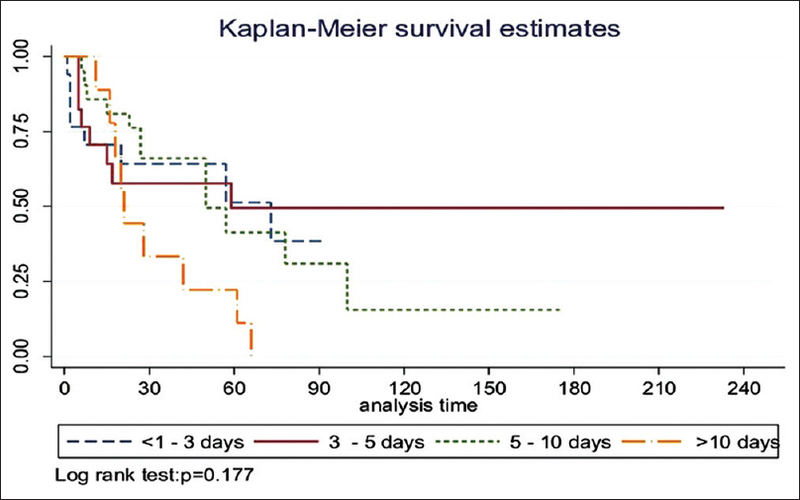 The survival rate fell when CPB times of 400 min and XC times of 120 min were breached; these findings did not reach statistical significance on univariate analysis (P = 0.201). In the study period, a total of 64 patients underwent arterial switch operation for TGA. Fourteen (22%) patients required VA ECMO support, of which seven survived the ordeal. One patient required mechanical ventilation and hemofiltration preoperatively and required “E-CPR” ECMO postoperatively. A total of 5 of the 14 TGA patients supported with ECMO were supported in an “E-CPR” state. The age range in our patient cohort was <1–5475 days (mean = 635 days, median = 60 days). We subcategorized the patients by age [Figure 1]. The majority of the children supported with ECMO in the postoperative phase were <6 months of age. This group had higher mortality rates compared to older age groups though this did not reach statistical significance (P = 0.502). The majority of patients had ECMO deployed in the operating theater following cardiac surgery, 36 patients (55%); E-CPR in 22 (33%) patients; and ECMO deployed in PICU due to “failed maximal medical therapy” being least common, eight patients (12%). [Figure 2] illustrates the patient outcome based on ECMO timing. 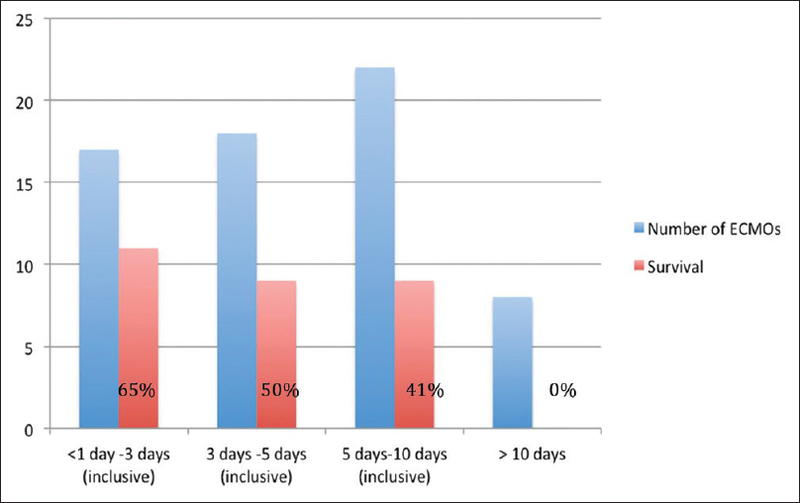 The relationship between ECMO duration (days on support) and survival was investigated [Figure 3]. We identified a trend toward worsening survival rate with increasing ECMO duration. There were no survivors when postoperative cardiac ECMO support exceeded 10 days in duration, among which only one patient was transferred to transplant center for VAD implantation but later died (see below). 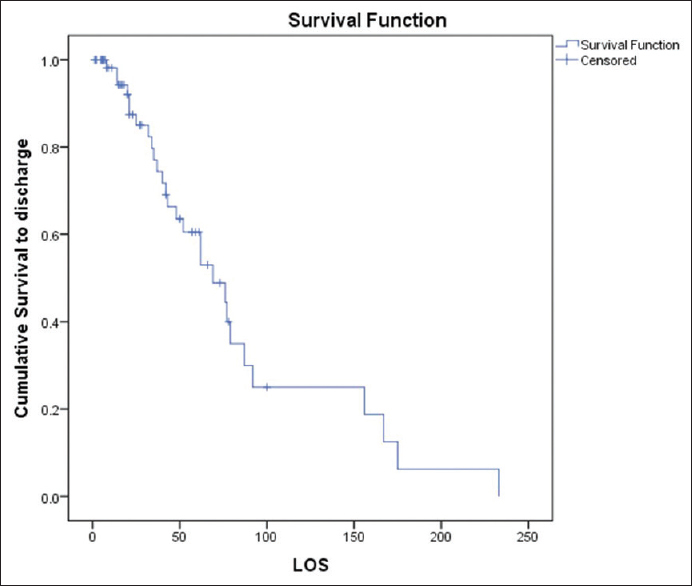 Univariate analysis, however, did not yield a statistical significance between ECMO support duration and survival [Figure 4]. Forty-six patients (70%) survived to ECMO decannulation. However, following ECMO decannulation, 16 (25%) died within 30 days. Overall survival to hospital discharge was 44%. Intermediate-term FU showed that all survivors to hospital discharge went home and remain alive (median: 960 days, range: 42–2010 days). One patient was transferred to a transplant center for a VAD, in view to be bridged to OHT, but died as a result of a large stroke in the intervening period. [Figure 5], [Figure 6], [Figure 7] illustrate survival to ECMO decannulation, to hospital discharge, and on FU, respectively. In our patient cohort, 59 (89%) patients had had central ECMO and only 7 (11%) had peripheral ECMO cannulation. Among the elective “end-of-case” ECMO patients, 32 (88% of the total “end-of-case” ECMO group) had central ECMO and only 4 (12% of “end of case” ECMO group) patients had had peripheral ECMO. Of the E-CPR subgroup, all but one were cannulated centrally, this being the most expedient route of establishing ECMO in this patient group. Finally, one other patient underwent emergency ECMO following re-admission almost 1 year after her original mitral valve repair due to severe mitral valve stenosis and low cardiac output. Of the “failing maximal medical therapy” cohort, 7 patients (88%) were cannulated centrally onto ECMO support and one patient had peripheral cannulation. Central ECMO cannulation tends to be the preferred option in patients <2 weeks postoperative as this was found to be the quickest and safest way of initiating ECMO support by the local surgical team. Major bleeding requiring re-exploration occurred in 24 (36%) patients. Eighteen (75%) patients were explored in the first 24 h. Six (25%) patients had no initial major bleeding but required exploration later on in the ECMO run for “latent bleeding.” Overall survival rate to hospital discharge in the explored group was 12 (50%). Survival rates for early bleeding versus late bleeding were 61% and 17%, respectively. Major neurological injury accounted for a significant proportion (23%, n = 15) of our patient cohort who received postcardiotomy VA ECMO, of whom only five survived to hospital discharge (P = 0.391). A further serious complication was NEC and the need for laparotomy (18%, n = 12). Among our patient cohort, six (9%) patients required laparotomies. Two patients required two separate laparotomies for NEC. Of note, none of our patients who underwent laparotomy in the postoperative period survived to hospital discharge. We believe that these cases were caused by hypoperfusion of the gut associated with a low cardiac output state or poor venous drainage of the gut. The incidence of renal failure requiring renal replacement therapy in our cohort was 17 (26%), of whom six patients survived to hospital discharge. None of the survivors required long-term dialysis after hospital discharge (P = 0.572). The summary of the statistical analysis is tabulated in [Table 2]. In our patient cohort, seven (11%) patients underwent cardiac catheter-based assessment and intervention. Four of these patients had catheterization, and interventions on ECMO included ballooning of pulmonary arteries or aorta, siting of pulmonary artery stents to alleviate elevated right ventricular pressures. Three patients had diagnostic catheterization only without intervention. Of note, four (6%) required return to the operating theater to address residual lesions. None of the patients who had cardiac catheterization survived. In our group, 33% of patients had E-CPR, as compared with 22% in another UK study by Balasubramanian et al. Despite this, Overall survival was not adversely affected by the higher proportion of E-CPR use. Although some studies suggest that ECMO instituted “early” or prior to cardiorespiratory arrest will carry a more favorable outcome,, this needs to be balanced by the potential for “over-use” of ECMO in patients who may otherwise avoid ECMO completely. Ultimately, such questions of ECMO timing and indication can only be answered by an intention-to-treat analysis. The occurrence of renal failure requiring dialysis while on ECMO is associated with a higher mortality compared with those patients who do not require renal support. One can speculate that either the requirement for dialysis denotes a higher risk group or dialysis in-of-itself can add additional complications. This question cannot be answered by this study. Over the recent years, we have moved to using continuous veno-venous hemofiltration in the majority of our cardiac ECMO patients, which we hope will provide a benefit to the patient. About a third of our patients suffered severe bleeding complications requiring re-exploration while on VA ECMO. We identified a significant decline in survival once there is latent bleeding as compared to early bleeding. Since then, we developed unit policy to aggressively explore major bleeding. We withhold heparin until blood loss is <3 mL/kg/h. We acknowledge that our study shows higher rates of central nervous system sequelae than what has been reported in large studies reporting neurological outcomes following “general” VA ECMO (10.9%) and the Extra-corporeal Life Support Organization registry. However, the large volume data reporting neurological sequelae of 10.9% pertain to all cases of ECMO (noncardiac surgical and postcardiotomy) and not solely postcardiotomy as is the case in our report. We believe that, in the context of postcardiotomy ECMO, there are other mitigating factors that could lead to higher rate of neurological injury, for example, the need for CPB in performing the original operation increases the risk of embolic and other neurological complications. Of note in our cohort, 13 (87%) patients who sustained major neurological injury had CPB runs exceeding 400 min. The need for DHCA also increases the risk of generalized cerebral hypoperfusion and neurological injury. To qualify the above point, a similar study to ours from another UK center by Balasubramanian et al. reported similar rates of neurological sequelae of 19%. Alsoufi et al. reported 17% rate of neurological injury and Gupta et al. in the largest study on the topic reported 10% stroke and 9% major seizure activity (it was unclear whether these were separate patient groups). The rate of E-CPR in our cohort was 33% (vs. 22% in the Balasubramanian et al's. study) leading to potentially greater cerebral hypoperfusion, which could be a mitigating factor for the higher rate of neurological sequelae in our study as seven (47%) of the total neurological sequelae in our study developed after E-CPR. This finding has led to the development of a novel “ECMO watcher” protocol in our institution to encourage the earlier use of ECMO and ensure the wider team is prepared should a patient have a clinical deterioration and require ECMO support. Our study has reaffirmed the finding that postcardiotomy VA ECMO has a definite survival benefit in pediatric cardiac surgery in a group of patients whom would have otherwise not survived without its use. However, institution of ECMO was associated with significant rate of severe complications. From our experience, it can be said that a key to a successful ECMO run is meticulous attention to hemostasis prior to transition onto VA ECMO. Hemostasis must be achieved while still on CPB. Once transitioned onto ECMO, blood products can then be administered to aid “nonsurgical bleeding.” In our practice, we utilize two methods to transition from CPB onto ECMO; (i) complete wean from CPB, then administer protamine and blood products with latent transition to ECMO, (ii) immediate or almost immediate transition to ECMO from CPB. The use of each method would depend on hemodynamic stability of the patient. In patients where the predominant issue is ventilatory, one can opt for method (i). This method confers the advantage of heparin reversal prior to transitioning onto ECMO. Giving protamine on ECMO is not favored in our institution due to concern of thrombosis; however, it can be done but with great caution at smaller doses and also depending on the activated clotting time levels preprotamine. In our experience, the problems encountered in premature transition from CPB to ECMO without adequate hemostasis include; (i) loss of volume in the ECMO circuit due to bleeding leading to multiple blood transfusions as well as ECMO flow instability. Bleedings while still on bypass can be sucked back into CPB circuit via pump suckers and transfused back to patients, therefore avoiding (or reducing need for) blood transfusion and its related complications and (ii) surgical hemostasis is more difficult while on ECMO, as surgical manipulation of the heart can disrupt the ECMO flow more easily. While we do not follow an institutional protocol applied to place a patient ab initio onto ECMO post-CPB, we advocate careful judgment for each individual patient's hemodynamics after coming off CPB on the following principles; (i) If the hemodynamics are labile or there is difficultly in ventilation postrepair, time is spent in the operating theater to assess the trends of hemodynamics and evaluate the need of ECMO before returning to ICU, (ii) full correction of any residual surgical lesions is essential before placing patient on ECMO, and (iii) if longer time is anticipated for recovery, for example, with poor ventricular or respiratory function, arrhythmias (e.g., junctional ectopic tachycardia), and after all residual lesions are addressed, then CPB could be transitioned to ECMO more seamlessly. We identified that postcardiotomy VA ECMO in younger infants, or those with a prolonged duration of VA ECMO, was the factor associated with a higher mortality rate. We found that mortality rate increased (albeit without statistical significance) with long CPB and XC times (see above). While this finding could reflect the general complexity of the operation and should not be interpreted in isolation as prognostic indicators, it raises the important question of whether the surgeon should persevere in correcting the pathological lesion at the expense of a higher CPB and XC times or “bail out” earlier to reduce these times, the answer to which fell out with the scope of our study. A policy of aggressive investigation, diagnosis, and management of residual lesions is key to a successful outcome to enable patients to be weaned off ECMO within several days of the initial surgery with no survivors in those supported on ECMO for over 10 days. Our study was limited by its retrospective nature, heterogeneity of the studied patient population, and limited number of patients. Our findings, although in keeping with the reported literature, did not reach statistical significance. Furthermore, in this study, we did not assess residual lesions and whether or not these were addressed in any subsequent operations. We regret that we did not have the data on “down time” prior to institution of E-CPR for this analysis as this could have explained our slightly higher rates of neurological sequelae. Application of postcardiotomy VA ECMO for cardiorespiratory failure has a definite survival benefit in a group of patients who would otherwise die. ECMO is expensive and carries significant rates of complications. Decisions surrounding indications and timing of this salvage modality remain a complicated and multidisciplinary decision and is made on an empirical case-by-case basis. The need for ECMO should be anticipated early, and elective ECMO should be instituted so as to prevent the need for E-CPR where possible. We found that end-of-case, in-theater ECMO carried better survival rates. Prolonged ECMO support had a direct correlation with mortality. We would like to gratefully acknowledge the help and support we received from our database manager Ray Samson. Chauhan S, Malik M, Malik V, Chauhan Y, Kiran U, Bisoi AK, et al. Extra corporeal membrane oxygenation after pediatric cardiac surgery: A 10 year experience. Ann Card Anaesth 2011;14:19-24. Walters HL 3rd, Hakimi M, Rice MD, Lyons JM, Whittlesey GC, Klein MD, et al. 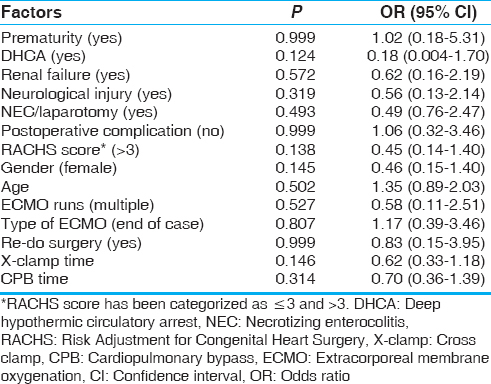 Pediatric cardiac surgical ECMO: Multivariate analysis of risk factors for hospital death. Ann Thorac Surg 1995;60:329-36. Thiagarajan RR, Laussen PC, Rycus PT, Bartlett RH, Bratton SL. Extracorporeal membrane oxygenation to aid cardiopulmonary resuscitation in infants and children. Circulation 2007;116:1693-700. Khorsandi M, Dougherty S, Sinclair A, Buchan K, MacLennan F, Bouamra O, et al. A20-year multicentre outcome analysis of salvage mechanical circulatory support for refractory cardiogenic shock after cardiac surgery. J Cardiothorac Surg 2016;11:151. Khorsandi M, Shaikhrezai K, Prasad S, Pessotto R, Walker W, Berg G, et al. Advanced mechanical circulatory support for post-cardiotomy cardiogenic shock: A 20-year outcome analysis in a non-transplant unit. J Cardiothorac Surg 2016;11:29. Balasubramanian SK, Tiruvoipati R, Amin M, Aabideen KK, Peek GJ, Sosnowski AW, et al. Factors influencing the outcome of paediatric cardiac surgical patients during extracorporeal circulatory support. J Cardiothorac Surg 2007;2:4. Baslaim G, Bashore J, Al-Malki F, Jamjoom A. Can the outcome of pediatric extracorporeal membrane oxygenation after cardiac surgery be predicted? Ann Thorac Cardiovasc Surg 2006;12:21-7. Raithel SC, Pennington DG, Boegner E, Fiore A, Weber TR. Extracorporeal membrane oxygenation in children after cardiac surgery. Circulation 1992;86:II305-10. Ghez O, Feier H, Ughetto F, Fraisse A, Kreitmann B, Metras D, et al. Postoperative extracorporeal life support in pediatric cardiac surgery: Recent results. ASAIO J 2005;51:513-6. Sasson L, Cohen I, Tamir A, Sternfeld AR, Berlowitz Y, Lenczner O, et al. Extracorporeal membrane oxygenation in pediatric patients: Our experience in the last ten years. Isr Med Assoc J 2013;15:13-6. Chaturvedi RR, Macrae D, Brown KL, Schindler M, Smith EC, Davis KB, et al. Cardiac ECMO for biventricular hearts after paediatric open heart surgery. Heart 2004;90:545-51. Fiser WP, Yetman AT, Gunselman RJ, Fasules JW, Baker LL, Chipman CW, et al. Pediatric arteriovenous extracorporeal membrane oxygenation (ECMO) as a bridge to cardiac transplantation. J Heart Lung Transplant 2003;22:770-7. Gajarski RJ, Mosca RS, Ohye RG, Bove EL, Crowley DC, Custer JR, et al. Use of extracorporeal life support as a bridge to pediatric cardiac transplantation. J Heart Lung Transplant 2003;22:28-34. Alsoufi B, Al-Radi OO, Gruenwald C, Lean L, Williams WG, McCrindle BW, et al. Extra-corporeal life support following cardiac surgery in children: Analysis of risk factors and survival in a single institution. Eur J Cardiothorac Surg 2009;35:1004-11. Bautista-Hernandez V, Thiagarajan RR, Fynn-Thompson F, Rajagopal SK, Nento DE, Yarlagadda V, et al. Preoperative extracorporeal membrane oxygenation as a bridge to cardiac surgery in children with congenital heart disease. 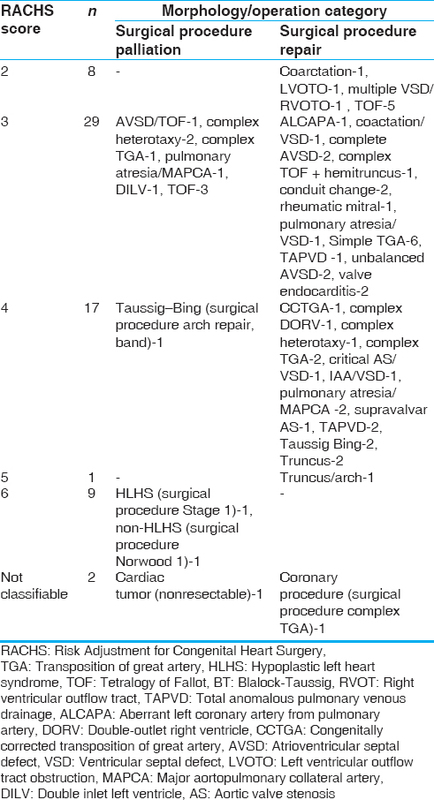 Ann Thorac Surg 2009;88:1306-11. DeRose JJ Jr., Umana JP, Argenziano M, Catanese KA, Levin HR, Sun BC, et al. Improved results for postcardiotomy cardiogenic shock with the use of implantable left ventricular assist devices. Ann Thorac Surg 1997;64:1757-62. Muehrcke DD, McCarthy PM, Stewart RW, Foster RC, Ogella DA, Borsh JA, et al. Extracorporeal membrane oxygenation for postcardiotomy cardiogenic shock. Ann Thorac Surg 1996;61:684-91. Stewart NI, Gunning K, Cuthbertson BH. Regionalisation of Intensive Care and extra-corporeal membrane oxygenation services in the UK: Beliefs about the evidence, benefits and harm. J Intensive Care Soc 2012;13:244-50. Borisenko O, Wylie G, Payne J, Bjessmo S, Smith J, Firmin R, et al. The cost impact of short-term ventricular assist devices and extracorporeal life support systems therapies on the national health service in the UK. Interact Cardiovasc Thorac Surg 2014;19:41-8. Duncan BW, Ibrahim AE, Hraska V, del Nido PJ, Laussen PC, Wessel DL, et al. Use of rapid-deployment extracorporeal membrane oxygenation for the resuscitation of pediatric patients with heart disease after cardiac arrest. J Thorac Cardiovasc Surg 1998;116:305-11. Itoh H, Ichiba S, Ujike Y, Kasahara S, Arai S, Sano S, et al. Extracorporeal membrane oxygenation following pediatric cardiac surgery: Development and outcomes from a single-center experience. Perfusion 2012;27:225-9. NICOR: National Institute for Cardiovascular Outcomes Research. Royal Hospital for Children (Glasgow) University College. London: National Congenitial Heart Disease Audit Website; 2015. Available from: https://www.nicor4.nicor.org.uk/CHD/an_paeds.nsf/0/02932AD3847B0A6B8025723500380741?OpenDocument?Centres. [Last accessed on 2017 Aug 01]. NHS Greater Glasgow & Clyde Women's and Childrens' Directorate. Information Pack: NHS Glasgow & Clyde; 2016. Available from: http://www.google.co.uk/url?sa=t&rct=j&q=&esrc=s&source=web&cd=4&ved=0ahUKEwiW6Jrbp8vQAhXDJMAKHUk6DKwQFggvMAM&url=http%3A%2F%2Fwww.nhsggc.org.uk%2Fmedia%2F234358%2F38354d-senior-clinical-fellow-in-paediatric-cardiac-surgery.doc&usg=AFQjCNFLugfy9TdJ79jxVU5ur_Yk0kjDhQ&sig2=4d2WGmIZJTX-K5e8puQLtg&bvm=bv.139782543, d.ZGg. [Last. [Last accessed on 2017 Aug 01]. Extra-Corporeal Membrane Oxygenation (ECMO): University Hospitals of Leicester NHS Trust; Available from: http://www.leicestershospitals.nhs.uk/aboutus/departments-services/heart-services/ecmo/. [Last accessed on 2017 Aug 01]. Gentles E, Mara J, Diamantidi K, Alfheeaid HA, Spenceley N, Davidson M, et al. Delivery of enteral nutrition after the introduction of practice guidelines and participation of dietitians in pediatric critical care clinical teams. J Acad Nutr Diet 2014;114:1974-80. Mara J, Gentles E, Alfheeaid HA, Diamantidi K, Spenceley N, Davidson M, et al. An evaluation of enteral nutrition practices and nutritional provision in children during the entire length of stay in critical care. BMC Pediatr 2014;14:186. Shah SA, Shankar V, Churchwell KB, Taylor MB, Scott BP, Bartilson R, et al. Clinical outcomes of 84 children with congenital heart disease managed with extracorporeal membrane oxygenation after cardiac surgery. ASAIO J 2005;51:504-7. Agarwal HS, Hardison DC, Saville BR, Donahue BS, Lamb FS, Bichell DP, et al. Residual lesions in postoperative pediatric cardiac surgery patients receiving extracorporeal membrane oxygenation support. J Thorac Cardiovasc Surg 2014;147:434-41. Howard TS, Kalish BT, Wigmore D, Nathan M, Kulik TJ, Kaza AK, et al. Association of extracorporeal membrane oxygenation support adequacy and residual lesions with outcomes in neonates supported after cardiac surgery. Pediatr Crit Care Med 2016;17:1045-54. Ravishankar C, Dominguez TE, Kreutzer J, Wernovsky G, Marino BS, Godinez R, et al. Extracorporeal membrane oxygenation after stage I reconstruction for hypoplastic left heart syndrome. Pediatr Crit Care Med 2006;7:319-23. Gupta P, Robertson MJ, Beam B, Gossett JM, Schmitz ML, Carroll CL, et al. Relationship of ECMO duration with outcomes after pediatric cardiac surgery: A multi-institutional analysis. Minerva Anestesiol 2015;81:619-27. Alsoufi B, Awan A, Manlhiot C, Al-Halees Z, Al-Ahmadi M, McCrindle BW, et al. Does single ventricle physiology affect survival of children requiring extracorporeal membrane oxygenation support following cardiac surgery? World J Pediatr Congenit Heart Surg 2014;5:7-15. Atik FA, Castro RS, Succi FM, Barros MR, Afiune C, Succi Gde M, et al. Use of centrifugal pump and extracorporeal membrane oxygenation as cardiopulmonary support in pediatric cardiovascular surgery. Arq Bras Cardiol 2008;90:216-20. Jaggers JJ, Forbess JM, Shah AS, Meliones JN, Kirshbom PM, Miller CE, et al. Extracorporeal membrane oxygenation for infant postcardiotomy support: Significance of shunt management. Ann Thorac Surg 2000;69:1476-83. Nasr DM, Rabinstein AA. Neurologic complications of extracorporeal membrane oxygenation. J Clin Neurol 2015;11:383-9. Hogue CW, Gottesman RF, Stearns J. Mechanisms of cerebral injury from cardiac surgery. Crit Care Clin 2008;24:83-98, viii-ix. Ziganshin BA, Elefteriades JA. Deep hypothermic circulatory arrest. Ann Cardiothorac Surg 2013;2:303-15.